What are some Annex icons? The Hot Docs Ted Rogers (formerly Bloor) cinema perhaps, or the Trinity St. Paul’s Centre. Some might point to the University of Toronto, or the streets lined with bay and gable style houses. Until recently, surely one would have said Honest Ed’s, or even the Victory Cafe. The neighbourhood pub closed late last year to make way for the Mirvish Village redevelopment, and seemed poised to go the way of that other storied pub, the Brunswick House. However, it’s about to reopen, and not for the first time. Opened in the 1990s, the Vic has been a go-to destination thanks to the vision and determination of original owner Paul Kellogg, who built the business on a simple, but effective, concept. The cafe had humble beginnings, to be sure. The first of the its three, soon to be four, locations was small but unique. Kellogg made an interesting decision when settling on the name for his new place. And soon enough the Vic gained a following. People — artists, professionals, students — from all over the city frequented the small cafe. When Kellogg ran the Victory Cafe it became a who’s who of people from throughout the city, including Mike Layton (Ward 19, Trinity-Spadina). But even though the cafe found success it was still difficult to keep up with bills and demand. 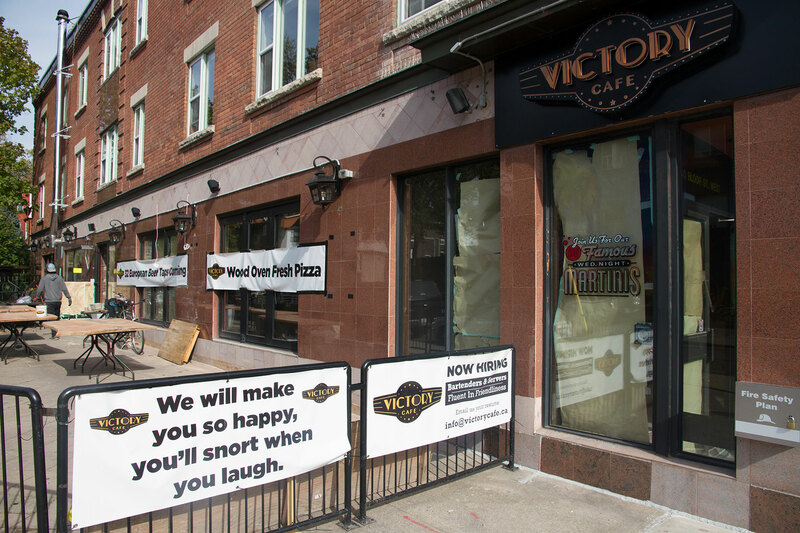 The Victory Cafe needed a bigger venue, and quickly, or it would soon start to flounder. The Victory Cafe managed to defy the building’s legacy and become an even bigger success in its new location, which Kellogg renovated. Posters from all sorts of performances lined the walls and the Victory saw the likes of John Candy and Stuart McLean come through its humble doors. The Vic’s new home at 440 Bloor Street West will have the same atmosphere as its previous locations, but feature a selection of European beer and a wood-fired pizza oven. He vows to maintain the spirit of the cafe in its new home. But a legacy like that is not likely to die out as Kellogg points out.